Ear in the Envelope Inc - Metal Stamping Jewelry Blog: Lizzie Lu Wrap Ring ... Ring Blanks? Lizzie Lu Wrap Ring ... Ring Blanks? I've been having fun in the studio!!!! Check out my most recent piece using an aluminum ring blank! 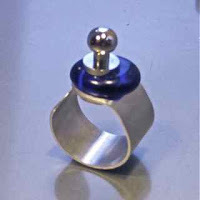 Please send me your creative ideas or pictures of finished pieces made using the Ring Blanks on my Etsy site! I would love to share your ideas and talent!!!! Ring blanks for wrapping, Ring blanks for tapping, Ring blanks for all your creative needs!! !